When it comes to singing, I’ve always had a low voice (for a girl). 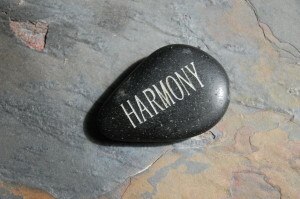 If I was chosen to sing for choir it was always harmony. The melody was left for those with stunning, clear voices in a higher range. Always knew that if they had to, the choir could do without me. Then there was that one morning at church. My friend Darlene was practicing for her special for the service. Darlene had a voice that everyone talked about. She could hit the notes of Mansion Builder as well as 2nd Chapter of Acts. This day she was singing Nobody Knows Me Like You by Benny Hester. She grabbed the extra mic, called me on stage to warm up with her. next to her and said “Do you want the harmony or melody?” As we sang, our voices blended in a way I didn’t think possible. It didn’t even matter what we called the notes we were singing, the message was coming through our souls. When we finished, she turned and said, “Your doing this with me this morning and your taking the second verse by yourself”. There was nothing in her that warned me to be perfect. She wasn’t worried I would embarrass her or the congregation. It was as if she overlooked my imperfect voice to my heart that had a message of God’s love that might burst if not allowed to share it. This morning as I journaled, I was reminded that not only are we one body in Christ but we all have a part to play. There was no mention of sitting in the pew because you didn’t have all the talent. 1 Corinthians 12:22 says that the parts that seem weakest actually bring the most strength. It isn’t always those carrying the melody or who display the most obvious gifts that are most necessary. So often we honor those we see doing the most obvious work in the body. Don’t get me wrong, the pastors, teachers and all “up front” folks need to be blessed and encouraged. We just can’t discount those who do the work of the ministry we don’t always see. The gentle hand that anoints a forehead and quietly prays for healing. The tear stained shoulder in a hospital room. The broken heart that listens to the stories of others whose paths are strewn with the wreckage of life behind them. Those who breathe words of life over deep wounds that have yet to find healing. They aren’t just the articulate voices or names we know well or the talented musician who fills the concert hall. Their books haven’t sold millions and their names aren’t listed in the church bulletin selling DVDs of their bible studies. Their voices still ring out in our midst. They sing the praises of our God and King. You’ll find them at Jesus feet in prayerful and calm beauty with a willingness to serve without the need to be known. My notes may seems off key, yours may be melodious and strong. We might hear other voices strained by their own crying. Others just need be heard. There are some who aren’t so sure of the words or the notes but long to join in a community. Sitting in front of the polished preacher is a woman whose hands bear cracked skin from endless dishes and diapers. Her weary lyrics still ring true. The man whose bride of close to sixty years took her last breath half a decade ago. His tune still resonates with the young men from youth group who’ve heard the chorus many times yet they listen with grace. Children picked up by a neighbor aren’t sure how to behave as the music fills the air around them. The Sunday school teacher who quietly guides, redirects and loves unconditionally speaks louder grace then any lesson in her book. Why are we waiting for perfect tone from those who just want to play their note? How come we haven’t called up those who sit waiting in a cold pew to stand beside us to blend our songs of worship and praise? Where is the sweet melody amid the noise of a crushed world? Have we forgotten the song He sang over us? Those who have a passion for Jesus want to live it out. They may not have what it takes by worldly standards but it’s time to set aside worldly standards for the sake of community and discipleship. Let’s set the table big enough for those who don’t feel equipped or deserving or loved. Bring chairs, add leaves and grab the cold willing hands. Praying for healing and like Paul did so often, offer grace and peace. One more thing, for some of us, it just might be time to share the mic.